Find hotel near Quality Inn Rainbow South .. 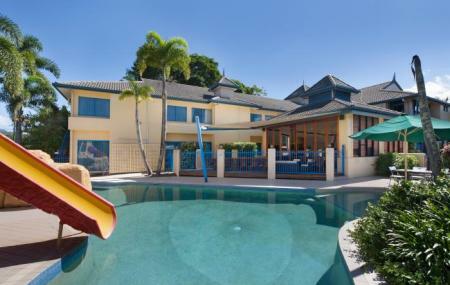 Located at a short distance from the Cairns Esplanade Swimming Lagoon, Cairns Inn Rainbow Southside or Cairns Southside international is a four-star accommodation with world class amenities and recreational activities around. The highlight of the complex is the pool area laden with palm trees. You can spend hours in the water, then soaking under the sun at the lawn with a glass of tropical drink ordered from the Legends Bar and Lounge. For your gastronomic retreat there is the Southside Bar & Grill A-La-carte restaurant offering delicacies of freshly caught fish and local seafood like oysters, scallops, bugs and prawns along with a huge selection of meat dishes and their signature pasta. From Oceanview Apartment to Luxury Spa Suite –you will have plenty of options for rooms. Priceline gave this place 4 stars and compared it to a Hyatt, that's a load of bull. This is maybe A 2 1/2 star hotel. If I went in thinking I was staying at a 2 1/2 star hotel, it would have been fine. We went thinking we were staying (and paying) for a 4 star hotel and came away pretty disappointed. Look at the pics, does this look like a 4 star hotel?